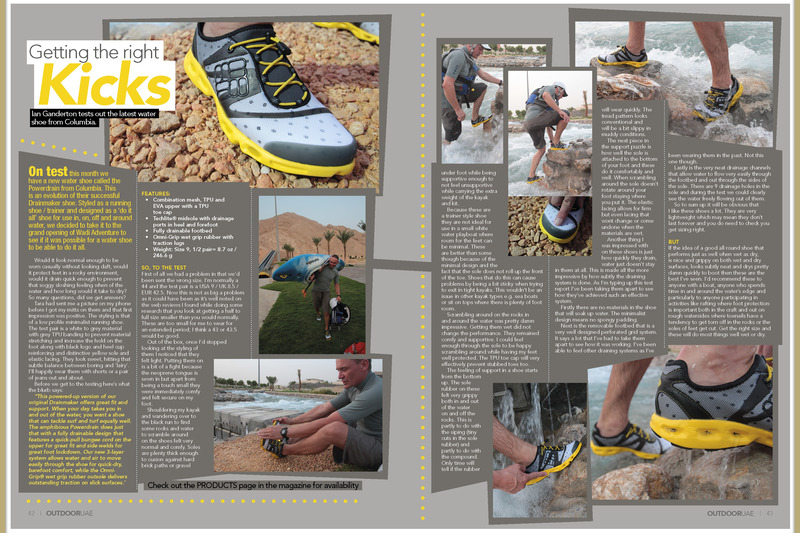 In this months Outdoor UAE we had a pair of Columbia Powerdrain shoes on test. If the idea of a good all round shoe that performs just as well when wet as dry, is nice and grippy on both wet and dry surfaces, looks subtly neat and drys pretty damn quickly to boot appeals then these are the best I’ve seen. I’d recommend these to anyone with a boat, anyone who spends time in and around the water’s edge and particularly to anyone participating in activities like rafting where foot protection is important both in the craft and out on rough watersides where toenails have a tendency to get torn off in the rocks or the soles of feet get cut. Get the right size and these will do most things well wet or dry. Event Overview: 18km (4 checkpoints) or 37km (6 checkpoints) over red dunes on 3/4 moonlit night. Start between 7 and 9pm. Teams of 2 (experienced) or 3. Social-so just come and camp. Location: Nazwa off Dubai/Hatta Road (approx 60 min from most locations in Dubai. Highlights: Red Dunes, Moonlight, Manned Checkpoints, Challenging though attainable course. Support Stations: Each Checkpoint will have water, other drinks. Event T Shirt – available in Med or Large only. Adventure HQ discounts on equipment on Event’s Equipment List GPS and course overview sessions at Adventure HQ from 7:30pm on May 1st and May 8th. Refund Policy: None, but you can transfer the registration – up to 24 hours before event starts. Please contact the event director for this. Race Pack Collection: From Adventure HQ between May 1st and May 9th. Please try to combine this with the information sessions on May 1st or May 8th at 7:30pm if at all possible. Outdoor UAE is organising a beach party at Jebel Ali Golf Resort and Spa. There are heaps of activities to ‘have a go’ at and then a party into the night. For readers of this blog there is a deal. Advance tickets are 100aed, on the door its 120aed, for you reading this its 75aed!!! Check out the details below. 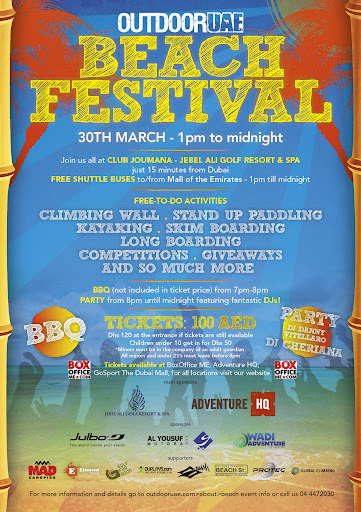 Get ready to enjoy the last days of the spring sun as one of the best outdoor events this year comes your way with the Outdoor UAE Beach Festival, taking place at the Jebel Ali Golf Resort and Spa – Joumana Club on Friday March 30th from 1pm until Midnight. Enjoy a great day out with friends and family on the beach with tons of free-to-do activities offered including: wall climbing, kayaking, stand-up paddling, long boarding, beach football, volleyball, skim boarding, fitness pursuits, slack lining, and much more. The fun won’t stop there; as the evening settles we will be bringing in summer beats and partying towards the midnight hour with our live DJ’s: Daniel Vitellaro and Cheriana, who will perform during the event. Amongst all that, there have even been rumors about some fire performers! Worried about getting there? We’ve got you covered! FREE Bus rides are prepared to ferry you and your group from the Mall of the Emirates to the venue and vice versa to ensure that you won’t miss out on partying with us! Tickets that will be available at the door of the venue will be priced at 120 AED. Valid ID’s are required on the door. Our main sponsors for this event are Jebel Ali Golf Resort & Spa and Adventure HQ. Other sponsors include Julbo, Al Yousuf Motors and Wadi Adventure who will offer some of the free activities and loads of prizes. For more details and other questions about the event, visit our website at http://www.outdooruae.com or contact us at 04-4472-030. You can also ‘like’ us on Facebook to get updates about the party. For the ‘special price‘ of 75aed contact 04-4472-030during office hours and say you’ve read my blog. The event will take place on a specially laid out course at Showka. Each lap will be around 10km and participants can compete either as solo riders or as teams of 2. The aim will be to cover the most laps during the 6 hrs. Showka is now the premiere destination in the UAE for mountain bikers with it’s fantastic flowing singletrack and rocky technical test pieces. The course will take in some new bits and some old favourites. The aim of the event is to have fun in which ever way floats your boat. If your a racing snake and out to win then great bring it on against some of the best in the region. If your more keen to just challenge yourself or even really along just to hang out and chat then thats just as great too. The mountain bike community will be there, we’ve got great support from the trade side of things with retailers Adventure HQ, Ride Bike Shops, Micahs Bike Shop and Wolfi’s Bike shop all having a presence along with clothing brands Endura and Buff also supporting the event. The event is free, all we ask is you ensure your properly prepared with plenty of water and food along with a bike properly kitted out for an endurance event on ‘proper’ mountain bike trails (see pdf flyer for our suggestions on this) as well as bringing plenty of mountain biking Joie de vivre. We’ll be camping out the night before to prepare for the event and also enjoying refreshment and socialising afterwards so please join us. We still need some marshalls, time keepers and helpers for the event, please contact us on https://www.facebook.com/groups/hotcogmtb/ if you can or know someone who can help out. 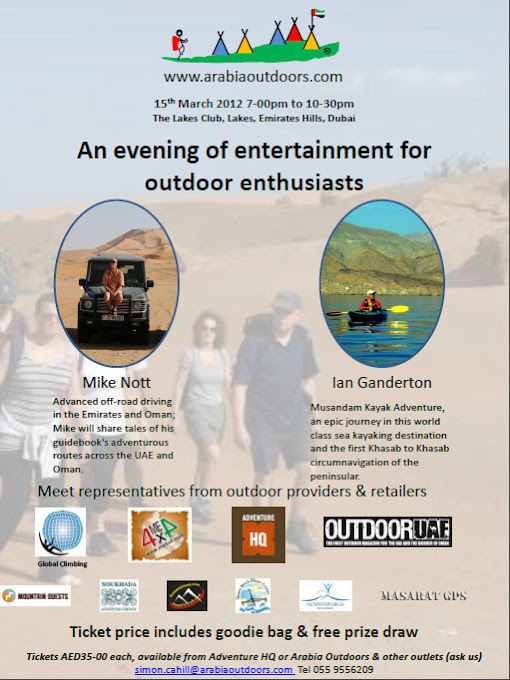 Please come and join us and the outdoor community for a social evening organised by Simon Cahill of Arabia Outdoors. Mike Nott is speaking about his extensive 4×4 adventures in the region and launching his new advanced offroading book. I’ll be warming up for him talking about my Musendam Circumnavigation Adventure that was, I believe, the first complete Khasab to Khasab circuit including the portage over the isthmus. It didnt go entirely to plan, 4 of us started and I ended up doing the journey solo due to a mild issue with deportation. Come along to the evening and I’ll tell you the whole story along with giving a guide to kayaking in this world class paddling destination. 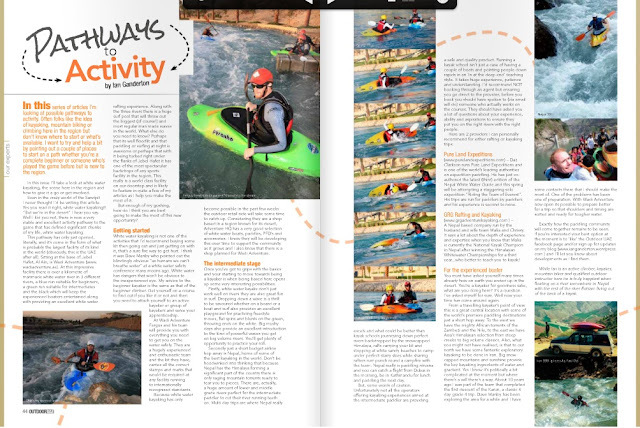 In this months Outdoor UAE is my article on white water kayaking here in the UAE. Yes you read that right, white water kayaking in the desert. First published in 1991 the Third Edition of the White Water Nepal Guide is now available. This iconic rafting and kayaking guide book has seen a thorough update and there are some significant changes. Firstly the original author, Peter ‘Green Slime’ Knowles, has been joined by co author Daz Clarkson who is one of expedition kayakings leading lights. Daz spends several months a year running trips in Nepal through Pure Land Expeditions and is the only person in the world to have kayaked all the rivers that flow from Everest. His current knowledge and expertise have helped bring the guide bang up to date. The guide is an invaluable tool for anyone planning a rafting or kayaking experience in Nepal whether as a client with a rafting company or as a dirtbag boater planning an extended season. The book is packed to the gunwales with information, stories, cartoons and detail that will both entertain and inform both beginner and seasoned verteran. Career Warning– Reading this book could lead you into the world of the expedition kayaker/rafter. It is a world of discovery including real adventure, cultural understanding, gobsmaking natural beauty and incredibile people achieving truly staggering things. If you’d rather sit in front of a screen of Column A and Column B than by a camp fire on a white sandy beach museing the days adventures while trying to spot satelites as they move across the sky in front of the Milky Way then this is not the life for you. Unfortunately these life choices don’t fit very well with a sensible career your Mother would approve of. The Third Edition of White Water Nepal by Peter Knowles and Darren Clarkson-King (ISBN 978-0-9550614-2-4) is jointly published by Rivers Publishing U.K. and Himalayan Map House Nepal and available from all good book shops.